Apollo, Starbuck, and Cassiopeia aid Michael and Sarah against the Eastern Alliance on the planet Paradeen. Three of the Lunar Seven children are played by the children of series creator Glen A. Larson. 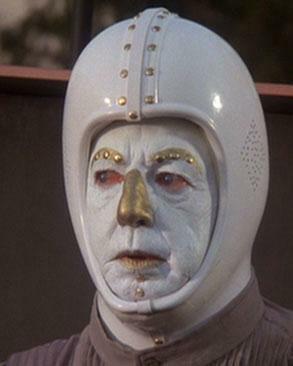 The android Vector is played by Ray Bolger. 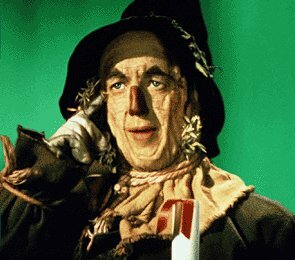 The facial make-up he wears for the role, particularly on his nose, is reminiscent of what he wore as the Scarecrow in the 1939 classic film The Wizard of Oz. The android Hector is played by Bobby Van. Van grew up with vaudeville and the previously-mentioned Bolger was a vaudeville performer in the 1920s. The short musical act the two androids put on for the humans' entertainment in this episode is reminiscent of one type of act seen in old vaudeville shows. As Adama speaks into his journal at the beginning of the episode, he says that Apollo, Starbuck, and the Lunar Avion have been gone for almost a secton (1 week). So, Apollo and Starbuck have been cooped up, trapped in only a seated position, going without bathing for a week in their Vipers before landing on Paradeen! (And how do they go to the bathroom? Depends.) At least on the Lunar Avion Cassie can walk around a little! It is as it approaches Paradeen that we learn that Michael and Sarah's ship is named the Lunar Avion (which is essentially Latin for Moon Bird). The Eastern Alliance military seems to be a cross between Cold War era Soviets and WWII Nazis in their uniforms, accoutrements, and attitudes. The interior design of the Eastern Alliance destroyer appears to be modeled after a submarine. The discussion between Krebbs and Commandant Leiter reveals that the Lunar Avion left Lunar Seven a month ago. Lanceman, one of Leiter's subordinates on the destroyer, mentions they are due on Lunar Nine in three days. This would presumably mean that there are at least nine of the "Lunar" colonies of Terra. Leiter tells Lanceman to set a course for Paradeen at star speed. The meaning of "star speed" is not explained; is it light speed? 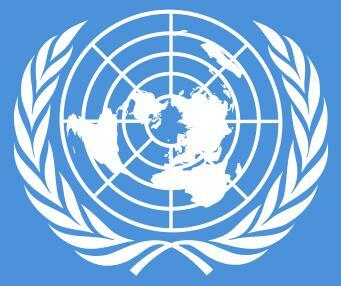 The Terran symbol seen on the hull of the Lunar Avion and on the arm patches of the occupants (right) looks a bit like the current United Nations symbol of Earth (left). Also, notice that there is a planet depicted in the lower half of the symbol that seems to show a close approximation our Earth's own continents! The spacing of the windows on the Lunar Avion doesn't quite match between the model seen in the space shots and the full-size ship seen at the Paradeen spaceport. Inside the house on the Fowler ranch at 58:21 on the DVD, we see what appear to be the horns of a longhorn steer, antlers of a cervid animal, and a mounted cervid head like a deer or elk. Who built the fire that is burning in the Fowler home when the group arrives? Presumably, Vector and Hector didn't start it before they left to pick them up at the spaceport; it's not the best idea to leave a fire burning in the house when no one is there to watch after it. And no one had previously gone into the house except the kids (who you'd think would be too young to be allowed to do so) and Sarah (who was upset and crying in the bedroom over her father's death). What is Apollo doing at 59:13 on the DVD? He turns towards the fireplace (off-screen) and raises his hands. Is he just enjoying the warmth? During Vector and Hector's song routine, one of the children is missing from the crowd, the youngest boy. I guess he was put to bed early. Aboard the Eastern Alliance destroyer, one of Commandant Leiter's men informs him it would take at least two months for a communiqué to reach Terra from their location since the light wave relay station on Lunar Seven was sabotaged. Since radio transmissions travel at the speed of light, the destroyer must be about two light-months out from Terra. When Michael is not willing to help Apollo find the coordinates to Lunar Seven, Apollo tells him he just traded 6 lives for 6,000. That would suggest that there are about 6,000 people in the fleet. Not many left over from all the 12 Colonies. The East/West conflict of Terra was meant to be representative of the potential hazard of the enmity of the then current Cold War between the United States and its NATO allies (west) and the Soviet Union and the Warsaw Pact (east). At 1:13:32 on the DVD, an airplane crosses in the background sky from the right of screen. The city scenes on Paradeen were shot at the grounds of Expo 67 (the 1967 International and Universal Exposition) in Montreal, Quebec, Canada. By 1978, when the episode was shot, most of the unused buildings were in a state of disrepair which allowed for the production to capture the feeling of a dead, futuristic city. Taking a shine to Hector, Starbuck comments he wishes he had a few more like him and maybe he'd put them on the Council of Twelve so they could start a world that reacts to logic instead of passion, greed, and jealousy. Starbuck must not be thinking straight because they are already fleeing an empire that is ruled by robots! The scene of the Lunar Avion and the Vipers parked at the spaceport at 1:18:41 on the DVD looks as if it was just shot on the Universal Studios lot. The hangar-like building appears to be a soundstage. I guess the series only had one full-size Viper to use for on-location shooting. We only see one at the spaceport when Apollo heads there to communicate with the Galactica. There should have been both his and Starbuck's. As they search for Starbuck in the bowels of the city, Apollo asks Hector if anything looks familiar and the lost android replies, "They all look familiar." Then it appears he says something else as well, but it has been dubbed over with silence. If you look closely at Hector's face at 1:26:24 on the DVD, it does not appear to be actor Bobby Van playing him under the make-up and helmet. It seems as if a stand-in was used. Apollo and Cassie use a pair of funky communicators during their search for Starbuck. Are these Colonial devices or were they obtained from the Fowler house? Despite his exhaustion, it would seem that Starbuck moved to another location from the scene at 1:30:44 to the one at 1:31:49 on the DVD. Notice that he is not banging on the same pipe later as he was in the earlier scene. Both Michael and Starbuck carry a silver-and-black gun when they storm in on the Alliance soldiers at the homestead. They must be Terran weapons obtained from the Morelands. 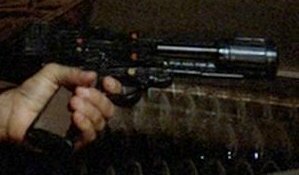 Speaking of Michael's gun, where did he get it? When we see him run up to the door outside with Apollo and Starbuck, he's empty-handed. When we cut to the interior as they all enter, he suddenly has the gun in his hand. With the Vipers damaged by Sarah's sabotage, Apollo and Starbuck ride aboard the captured Eastern Alliance destroyer with their captives in order to return to the fleet. Were the Vipers left behind permanently? Would the Alliance find the wrecked ships and reverse-engineer them? Or maybe Apollo made arrangements with Michael and Sarah to destroy the ships so they wouldn't fall into the wrong hands. Pages 82-end cover the events of "Greetings from Earth" Part 2. Pages 83-86 contain an added scene in which Boxey presents himself to Commander Adama to be briefed on the status of the missing Terran ship. Throughout the book, Hector is presented a bit differently than in the episode in that he has a double-strength vocabulary tube installed, which causes him to often speak a string of words that have the same meaning while making his point. On page 94, Vector accuses his "son", the way he sits with legs crossed and hand on his hip, of looking like a pansy! Not that there's anything wrong with that. On page 95, Vector and Hector discuss baseball, another red herring that Paradeen is a colony of Earth. The teams mentioned are the Lunar Six Giants and the Terra Five Blue Sox. The hovercraft driven by Vector and Hector are presented as actually flying 20 feet in the air. On page 98, Hector exclaims, "Holy Moley!" The slightly different spelling, "Holy Moly" was first used by the super-hero character Captain Marvel in Whiz Comics #2, February 1940. The book suggests that Sarah's father was a scientist. In the televised episode, it is not clear what profession he may have had before his death. On page 103, Zixi mentions her cousin Maxine's missing earring, worth $100,000. I guess besides cubits and frenkels the Colonials also use dollars! On page 106, Hector serves the humans steaming hot cups of Javine, which Starbuck compares to nearcaf. These two terms are probably meant to evoke "java" and "caffeine", both used to describe coffee here on Earth. In the book, it is Hector who follows Sarah out of the house at night instead of the two little girls as in the televised episode. On pages 115-116, Apollo meets a Paradeen hermit named Kurtiz who has some low-level telekinetic abilities. Later, Starbuck meets a young woman gang member in the city who also has psi abilities. It's never explained why these two unrelated characters should have psi abilities; I suppose the implication is that it has to do with mutation caused by the chemical/biological attacks by the Eastern Alliance in past years. On page 116, Hector offers to fix snapjacks for breakfast. Obviously this is meant to suggest the flapjacks of Earth cuisine. Later, on page 159, Starbuck uses the phrase "they'd sell like hotcakes" (another Earth expression), referring to android duplicates of himself he jokes he'd like to have made. On page 117, Hector mispronounces Starbuck's name as Starburst. Also on page 117, Hector describes the city as lying 10 miles from the homestead. "Mile", of course, is an English, Earth unit of distance. The book suggests a somewhat more alien environment on Paradeen than is seen in the TV episode, such as blue grass and trees and orange birds. The book reveals that Sarah's husband was killed on Lunar Seven over two years ago. In the book, Michael's daughter is the youngest girl instead of the oldest one as in the televised episode. Starbuck's adventure in the city is quite a bit different in the book than in the televised episode. Here, he's taken there by Hector but then is captured by a street gang of young adults. He claims to be a pilot hauling a load of weapons that he can give to them in exchange for his life. He then befriends the young woman, Queenie, who is leading him back to the spaceport and, with Apollo's intervention, they both escape the gangs of the city. They manage to collect up some books on Terra from the abandoned library while they're at it. The cover of the book depicts Starbuck's and Queenie's visit to the city library on Paradeen, but for some reason it appears they are being attacked by robots instead of the human gang, the Commandos (though the attackers may be humans wearing gas masks for some reason). On page 147, Big Words refers to Starbuck's laser as a blunderbuss. This may be due to the design of the Colonial weapon, which has a flared muzzle as in the TV series, a feature of Earth guns called blunderbusses invented in the 17th century and mostly out of use after the 19th. In the last chapter of the book, Apollo does give Sarah one kiss.